If you're in Japan looking for a middle-aged Japanese man who can listen to your problems, help you lift heavy things, or do just about anything else that's not creepy or sexual, you have a valuable resource: the Ossan Rental service. They rent just such gentlemen, called ossan, by the hour. Your pals at Tofugu rented two ossan—you can read about the first here—and also reviewed the company itself. We met our second ossan in front of the Gundam Cafe in Akihabara. He goes by the pen name Yasashii Shufu, which roughly translates to "Kind House-Husband." He told us he came up with this name because, at home, he is the main person that takes care of his four-year-old daughter, and he does most of the housework. 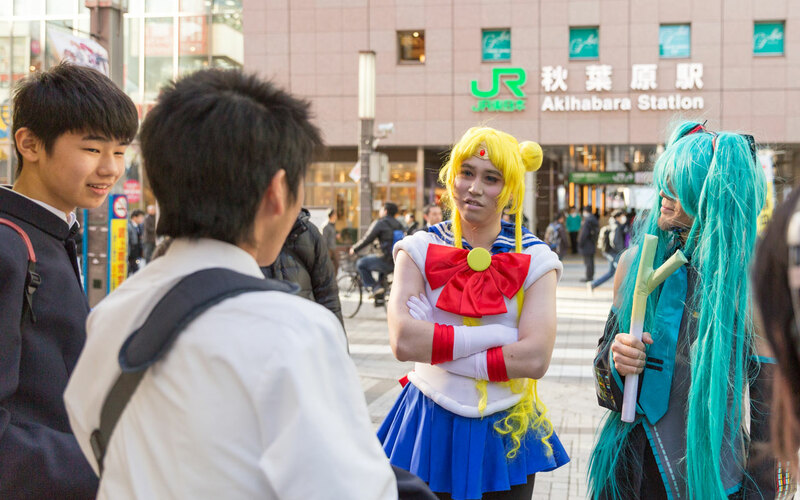 We had met in Akihabara, a city bustling with anime culture, because we were headed to Studio Crown, a photography studio for cosplayers. When you rent an ossan, you can request what you're planning to do. Ours was to do cosplay together…but more about that in a minute. The day we met, Yasashii Shufu was forty-three. He told us he was a self-employed gardener whose hobbies included travel and surfing, and that the people he respected most in the world were Jakucho Setouchi, Jack Bauer, and Bruce Lee. He told us he'd been a rental ossan for eight months and had been rented about fifty times. Yasashii Shufu wearing the tenugui we gave him. "This will be good for my gardening work!" he said. We asked him what kinds of things people rented him for. "I'm an ossan who has seen a lot of the world," he explained. "I'm good at listening to my clients or helping them with things. Sometimes it's really simple, like when one female customer asked me to carry a heavy thing down from her apartment on the fourth floor; she just needed a male hand. Other times, people rent me to listen to their troubles and worries. My jobs range from physical labor to listening to serious problems." 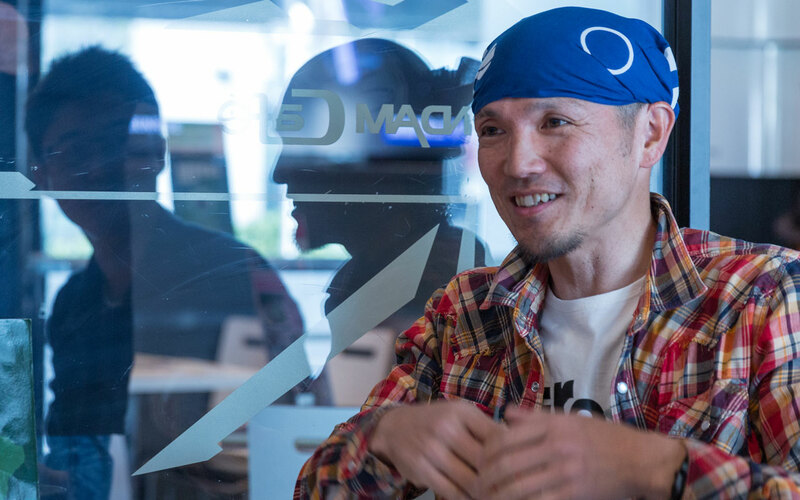 When asked why he wanted to become a rental ossan, Yasashii Shufu explained that in these times, when human rental businesses such as "rental boyfriends" are gaining popularity, he thought of Nishimoto Takanobu, the founder of Ossan Rental, as doing something completely different. "I was really moved when I realized I could actually help people," he said. "I can't tell you the details, to protect my clients' privacy, but as an example, I had one job listening to someone's painful feelings when they were thinking about committing suicide. I learned that just by listening to them, I could make them feel better. And I may be able to prevent them from killing themselves." He said that prior to this kind of realization, he had thought of such businesses in a negative light. Yet with this new understanding, his opinion changed. 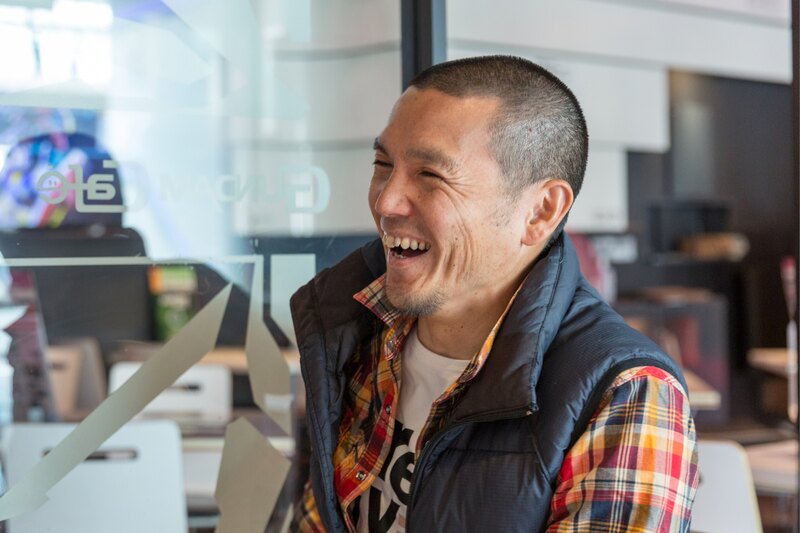 "I realized people didn't really know about the potential of Ossan Rental. It's actually helping people." We asked him how many of his clients need that kind of help. "I'd say about 10%. Again, I can't go into detail, but there was one recently who had a serious illness. This person's friends and family had left them. I was rented just to be someone who could chat with. I could really tell they just wanted to talk—to have some human interaction. That meant a lot to me." "I'm an ossan who has seen a lot of the world," he explained. "I'm good at listening to my clients or helping them with things." When we asked him about any strange or amusing rentals, he told a story that sounded oddly familiar: "One time, a comedy duo asked me to pretend to be a fan of theirs at a comedy show. It was like a comedian audition show, and depending on audience votes, someone could win. Of course, I had to vote for them in the end; it was the reason they rented me. It was a lot of fun. I got to watch a free comedy show!" Almost word-for-word, his story matched one told by our other ossan, Omocha-kun. Finally, we asked him the details of the job interview. "It was at Starbucks, just me and Mr. Nishimoto," he recalled. "It took about two hours. He told me about some of his past rental experiences, which made me want to join even more. We got really excited because we were both ossan. At the end, Mr. Nishimoto told me that I'm definitely an ossan. My response was: ‘Oh yeah? Ha, just like I suspected!' Then he told me I was hired." 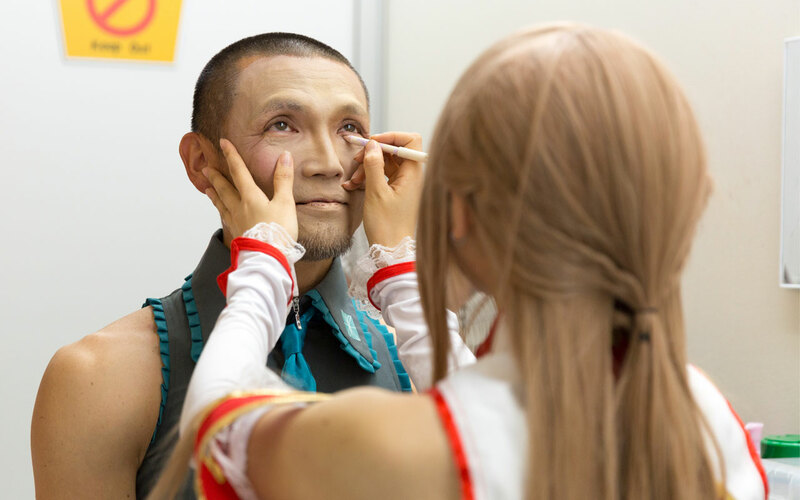 We couldn't spend all our time interviewing Yasashii Shufu, however, because we had purchased only a few hours with him, and had an appointment at Studio Crown for some cosplay. He seemed a little hesitant at first, but as we drew closer to the studio, he got more excited. Experiencing crazy things with a person you just met really brings you closer together. Returning to the studio, we had some time together to change clothes and remove our makeup. We talked about ordinary things—what his daughter was like, what he does for fun, what he thought of the whole ossan experience. We had become friends, in a way. He even messaged us later, offering to drive us around Tokyo, off the clock, over the weekend. Renting Yasashii Shufu remains one of our fondest memories of Tokyo (along with renting a homeless Japanese man), and it was with someone we paid to hang out with us! And even though it was a transactional agreement, the time we spent with our two ossan didn't feel that way. Ossan don't get paid much—just ￥1,000/hour—so they're not doing it for the money. Instead, and more importantly, they do it to make new friends, experience new things, and interact with other human beings. This is the core of the Ossan Rental service and the ossan who are registered there. Yasashii Shufu exemplified this—you could feel it coming through him during our time together. Since this review was written, Yasashii Shufu is no longer listed as an ossan on the site. But there are many others waiting for your request. To learn more about renting ossan (including ideas and how to do it), check out our review of the Ossan Rental service. We can't wait to do it again!